AGNES OF HARCOURT IS AN IMPORTANT though little known thirteenth-century author. Born into a leading Norman noble family, she became an abbess at the new royal Franciscan abbey of Longchamp, founded just outside of Paris by Isabelle of France, sister of Louis IX. 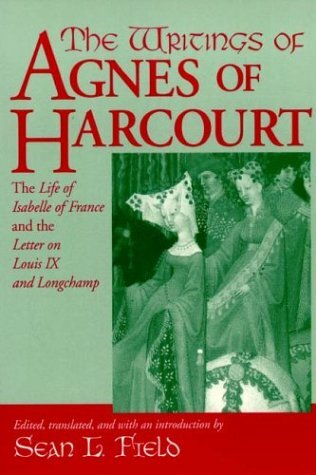 In the 1280s Agnes wrote a substantial biography of Isabelle of France, as well as a brief letter detailing Louis IX's involvement with the abbey. These texts were based on Agnes's first-hand observations and contained many lively stories about their royal subjects. Agnes's writings provide a fascinating window on religious life at the court of St. Louis and on the lives of some of the most interesting and powerful men and women of the day. More significantly, they preserve one of the very few female perspectives we have for this period, and, in The Life of Isabelle, offer what is probably the first biography of one woman by another in French. Based on new research into the surviving archives of Longchamp, The Writings of Agnes of Harcourt presents the first English translation of her texts, and the first substantial introduction to her life and work. This critical edition includes both the old French and English versions of the texts.